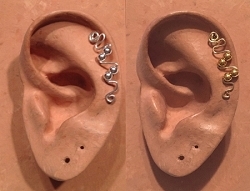 Unisex ~ A great gift for both men and women! 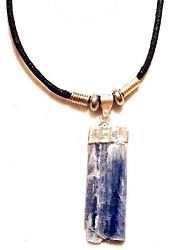 This X-Large single point rough cut Clear Quartz crystal pendant carries the properties of the clear quartz stone and are often used in healing. Pointed away, it draws energy off the body. Pointed inward, it channels energy inward. 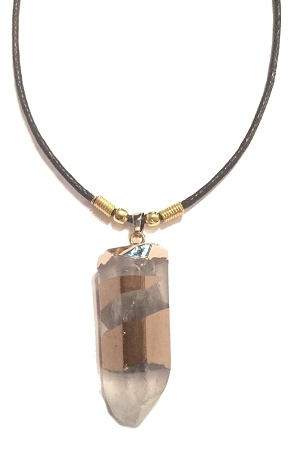 The handmade gold dipped rough cut clear quartz pendant necklace is made with your choice of cord color and length with a lobster clasp closure. 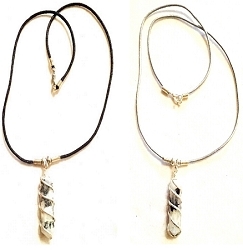 If you would like a longer or shorter cord for your necklace, send us a message and we will make it whatever length you would like at no extra cost. 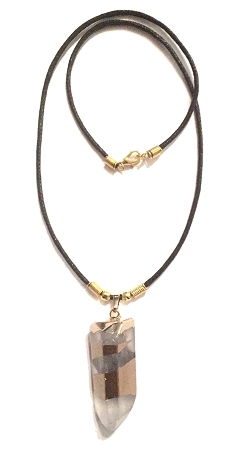 These rough cut clear quartz pendants with gold stripes measure approximately 2" x 3/4" to 2 1/4" x 3/4", including top loop. Some may be larger. Comes gift boxed too! 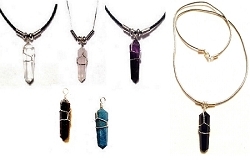 Clear Quartz (clear stone) - is a receiver, conductor and generator of energy. 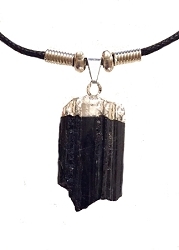 Used for meditation, transformation, stability, knowledge, protection, healing and enlightenment. Aids in general good health and increases auric field.